MISSION ESL COMPUTER LAB: "The Dance of The Bees" from Edcon Publishing. "The Dance of The Bees" from Edcon Publishing. Bzzzz . . . . . This sound tells you that a honey bee is around. To you, she seems to be saying, "Get out of my way or I'll sting you." But she uses' quite another language to talk to her fellow bees. Suppose the bee finds a patch of clover blossoms or some other sweet-smelling flowers. 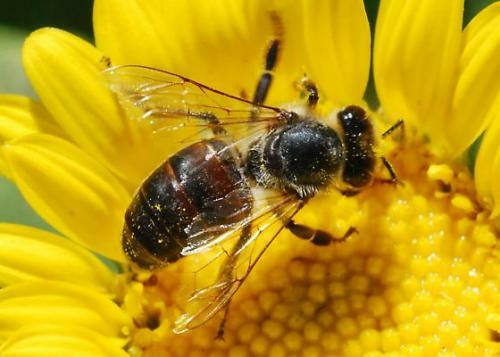 To a bee, a sweet-smelling flower means food. Flowers are rich in the juices (called nectar) that bees use to make honey. The bee then flies back to the beehive quickly, for she can hardly wait to report what she has found. And when she gets back, she does a funny little "dance." Just by watching her, the other bees can tell where she discovered the clover. Soon, they are on their way to the spot themselves. After they collect sweet juices from it, they will bring it home. Later, it comes out as honey that they leave inside the hive in honeycombs. Thousands of bees belong to every beehive, and each bee has a special job. Some bees do nothing but collect the sweet juices from flowers. Some guard the hive. Some keep it clean, and some make certain that the air inside does not grow too hot or too cold. Either way would not be healthy for the baby bees. There are also bees that do nothing but take care of the young. The bee spends its life serving the needs of the beehive. Bees must work together very closely for life to go on, and for this reason they depend strongly on language. To be good messengers, they must know how to "talk" to one another. 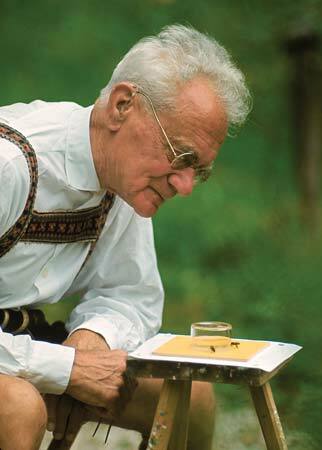 About thirty years ago, someone discovered that bees have a language. Karl von Frisch studied bees for many years. At last,it struck him that the funny little dances of the bees were words in their language. The bees were telling each other important things with their strange dance steps! Can you imagine how excited Karl von Frisch was when he made his discovery! Karl von Frisch saw that when a bee returns to the hive after finding something sweet, she does what looks like a wild dance. She dances in front of the other bees that have the job of gathering food. The different steps tell them the distance she had to travel to find the food and how the flowers smell. The other food-gathering bees join in the dance. If the sweet food is only a short distance away, the dance that is done is called the "round dance." This is a dance in a circle, the bee going first in one direction and then making another circle, going in the other direction. When they know the prize is near, the other bees soon find it, flying about very quickly to the exact spot. But if food blossoms are a mile or more away, the messenger bee does a different dance, called the "wagging dance." This dance has a lot more to say. In it, the bee runs about, in only part of a circle and then cutting across it. Then she does this again, wagging her body as she goes. If she dances very fast, she is saying that the distance is very far. The slower the dance, the closer is the field of clover or other flowers. The wonder of it all is that her dance tells the others exactly where to find the place. It shows them in which direction to fly and how to recognize the food by its smell. When bees wish to move to a new home, certain bees have the job of going out alone to search for a place. When they return, each messenger does a dance to report to the hive what she has found. Each house hunter tries to prove that she has found the best place. Then there is a lot of "talk" back and forth. Finally, they decide on a new home. Karl Von Frisch found that a lot of excitement goes on while the matter is being talked over. There is another way that bees move to a new home. Thousands of honey bees leave, taking a queen with them. This group is called a "swarm." 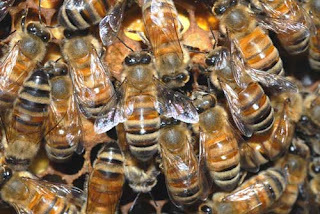 Where the queen lands, the swarm forms around her, hanging together like some great wagging beard. Karl von Frisch called this the "swarming dance." Another amazing thing is that bees from different countries do not speak exactly alike. People from New York do not talk exactly like people from Texas, so why should bees everywhere have the same way of talking? a. will sit on it to smell it. b. takes juices from it back to the hive. c. will try to sting it. a. they don't trust each other. b. the hive is crowded. c. each has a special job to do for the hive. d. it helps them keep warm. each has a special job. a. tell important things to other bees. b. carry notes to the hive. c. tell stories about bees she has met in other places. d. fly as far as she likes. a. lived a hundred years ago. b. thought bees were stupid. c. wrote a book about clover. d. studied the language of the bees. a. to amuse the other bees. b. to make the other bees join in a circle. c. only when the bee finds clover. d. to tell the other bees that sweet food is near. a. shows that she wants to have a party. b. tells the others about food blossoms that are far away. c. keeps the hive warm. d. tells the other bees where to put the honey. a. night is about to fall. b. the bee is in a hurry to finish the dance. c. the other bees will have to fly far. d. the bee is a good dancer. a. they would get more work done. b. they would have less fun. c. they would have to find some other language. d. we would understand them better. they'd have to find another language. a. "How Bees Make Honey." b. "Language Is Used by Everyone. " c. "The Language of Honey Bees." d. "The Way Bees Have A Party." "The Language of Honey Bees." b. how bees "talk" together. d. the color of bees.